The initial phase of the Charleston International Airport parking expansions calls for 250 new spaces by Thanksgiving. Construction crews at the Charleston International Airport are working to complete an initial expansion of parking capacity before the always hectic holiday season sets in. By Thanksgiving, vehicle parking at the Palmetto State's busiest airport will increase by about 250 spaces, with another 1,300 being overhauled — all of them in outlying lots south of the main terminal. But the work is just the prelude to the construction of a new five-tier parking deck designed to contain 3,000 spaces. That phase of the project will commence early next year. The new structure will be located just south of the current three-level deck, which holds 1,268 parking spaces, and both will be connected to short-distance walkways leading to the main terminal. The building site for the new deck currently serves as the airport's main outdoor surface-level parking area, which has accommodated cars and light trucks for years. Parking will soon be redistributed to other nearby lots prior to the holidays to make way for the new five-story deck. The upgrade and addition of new parking should ease the crunch expected once construction begins on the new structure. 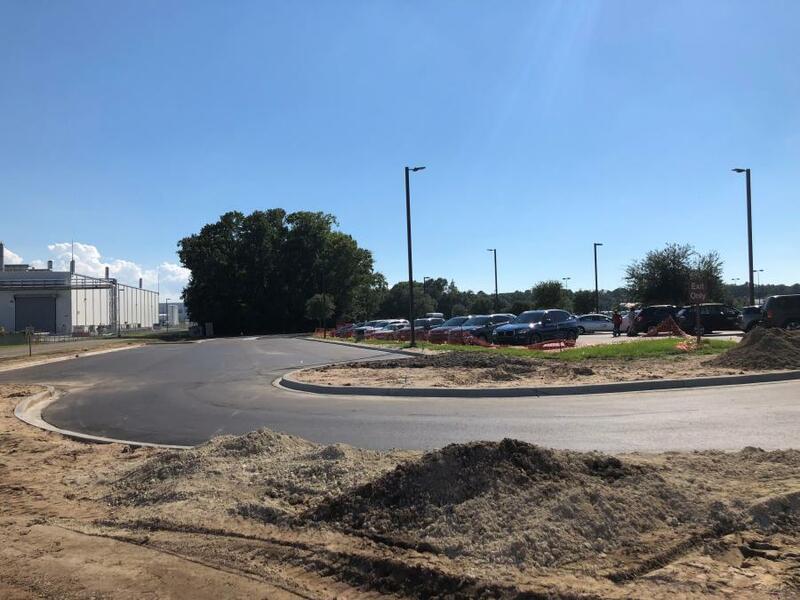 The current phase of the new parking project is being handled by Banks Construction, an asphalt and paving contractor with 70 years of experience with similar jobs across South Carolina's low country. The company's main office is in North Charleston. 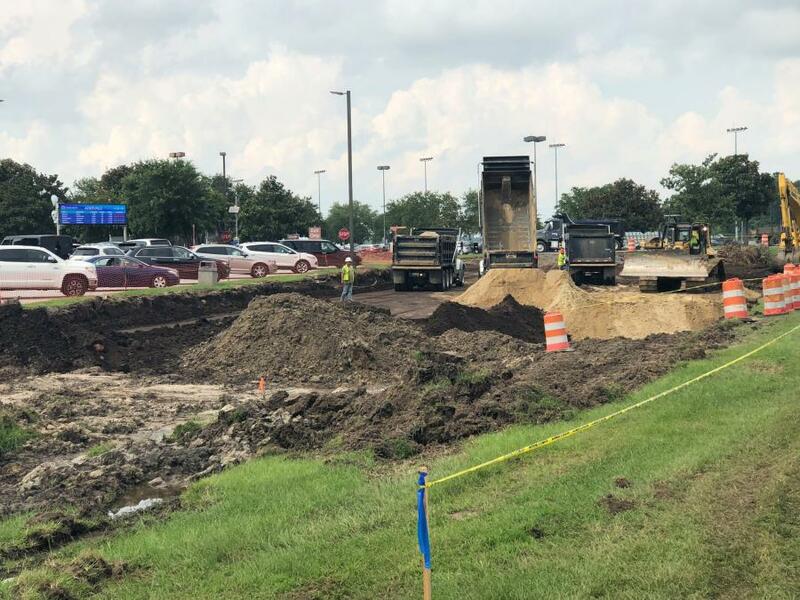 Graders, dozers and pavers from Banks have been moving around the airport's cellphone waiting lot since July to double the parking there from 40 to 80 spaces. 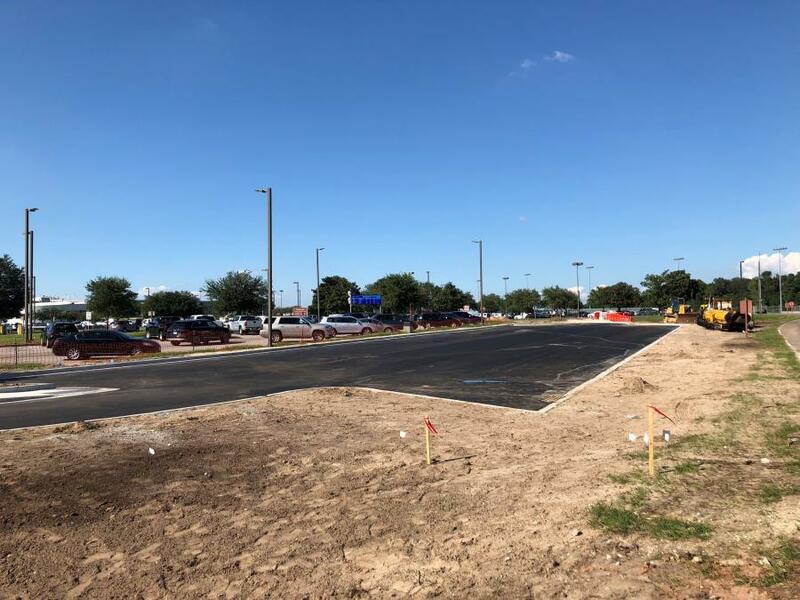 Another 1,476 spaces also are being upgraded — with an additional 176 new parking spots — in the twin overflow lots just to the east. Britton Corbin, director of engineering of the Charleston County Airport Authority, said the contractor has been adding pavement by clearing existing grassy areas and removing the topsoil before coming back to dump fill dirt and complete compacting and paving. No substantial clearing has been needed. 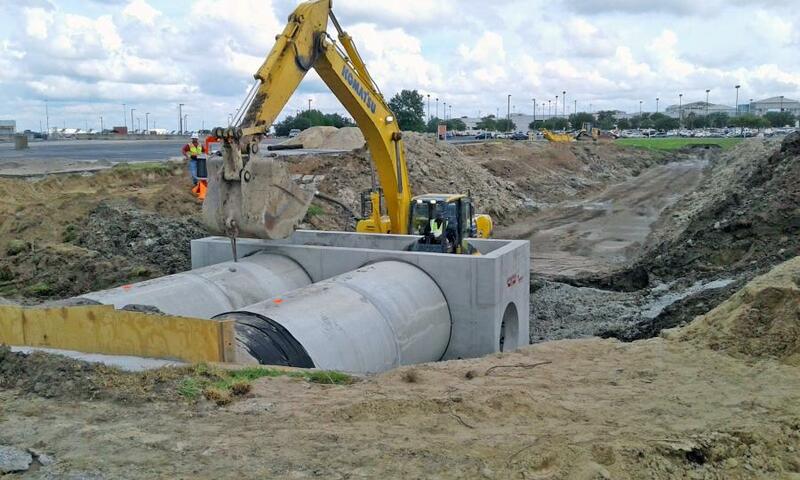 “In those other remote lots, besides the cellphone waiting area, we are essentially filling in some ditches and drainage areas to add parking,” Corbin said. The construction is right on schedule to be finished just before the annual Thanksgiving travel rush — despite Hurricane Florence plowing through the area in September and dumping huge amounts of rain, Corbin said. He added that the airport is helped by sitting at an elevation of about 30 ft., which is high for the South Carolina coast. Corbin expects “substantial completion” of the new surface lots to be finished by the first week of November. More than 4 million passengers moved through the airport in 2017, and the figure is expected to reach a record in 2018 due to new airlines and routes servicing the complex, said Paul G. Campbell, executive director and CEO of the Charleston County Aviation Authority. Airport officials want to keep the new parking areas relatively close to the terminal during this new construction so that passengers, and their luggage, can quickly be checked in. Although Corbin did not name a start date, he said construction would begin on the five-level parking garage just after the beginning of 2019. He described the garage as a precast structure totaling approximately 1 million sq. ft. In addition, Corbin said, the Charleston County Aviation Authority was finalizing the design and would soon request construction bids on the new parking deck. Charleston-based LS3P Associates designed the surface parking lots, as well as the new deck, Corbin said. The architectural and engineering firm has offices in South Carolina, North Carolina and Georgia, and serves clients across the Southeast. The new parking deck at Charleston International is part of a master plan designed to upgrade the airport and stay ahead of its projected growth over the next five to 10 years. The plan, in turn, follows the Terminal Redevelopment and Improvement Program (TRIP), completed in 2016, that renovated the entire airfield and its passenger-services buildings.